After many hours of sweating in the gym, their hard work pays off when they step into the international lime light, competing for the whole world to see. North-West University (NWU) bodybuilder David Tshose is such a dedicated athlete. He recently represented South Africa as member of the national team that took part in the World Bodybuilding Championships in Ecuador, South America. 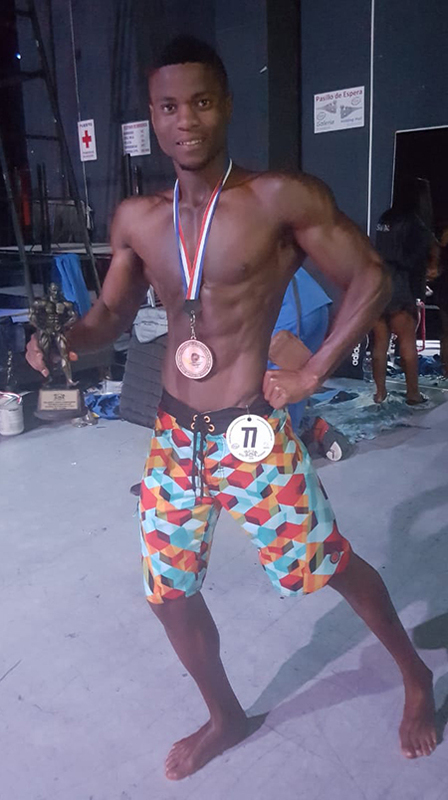 David, a fourth-year psychology (BSocSci) student at the NWU’s campus in Mahikeng, competed in the men’s category Athletic Physique under 178 cm. He came third in this category, beating many hopefuls. “It was an amazing experience to compete and be rated among the top three in a world competition,” said David. David has an impressive track record. He boasts a second-place trophy from the provincial Gentle Giant bodybuilding competition, first place and overall winner of the Potchefstroom Championship, and making it to the top 10 at the 2018 Arnold Classic Africa competition. David Tshose shows off the gold medal he secured at the World Bodybuilding Championships.